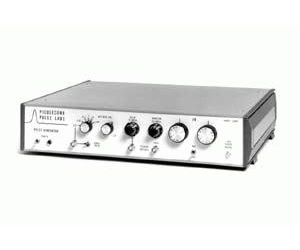 The Model 2600C-300NS Pulse Generator produces high amplitude 45 V, fast (<500 ps) risetime pulses. 50 V, 250 ps risetime pulses are available with the “Turbo” option. The pulse duration can be adjusted with a front panel, ten-turn control from 2 ns to 300 ns. Either a positive or negative polarity pulse is selectable by a front panel switch. The amplitude may be adjusted over a 70 dB range in 1 dB steps while an internal clock provides pulse repetition rates up to 100 kHz.